Those who travel through Timmerman Junction in southern Blaine County can once again take a refresher at the intersection's rest area. After eight months of construction, the rest area at the southwest corner of the intersection of state Highway 75 and U.S. Highway 20 reopened for public use on Monday. The project cost $2 million, funding that some critics of the Idaho Transportation Department's handling of Timmerman Junction claim could have been better spent on safety improvements at the accident-prone crossing. However, ITD spokesman Nathan Jerke explained that restroom reconstruction money comes from a different funding source than does money for highway improvements. Jerke said the rest area was in ITD's funding cycle for five years before construction started, and the work was planned and scheduled before a recent rash of accidents raised public awareness of the hazards at the intersection. 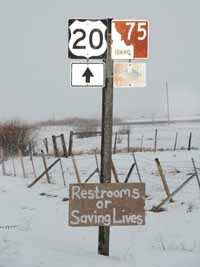 "If we're going to have rest areas, then we have to keep them up to standards," he said. Reconstruction at the rest area involved expansion of the restroom building, expansion of the parking lot with separate areas for trucks and passenger vehicles, improvements to the sanitary sewer system and improvements to the storm drainage system. Improvements were also made to satisfy the Americans with Disabilities Act, including installation of ramps to the restroom building and installation of handicap-accessible spaces in the parking lot. Meanwhile, ITD announced earlier in December that it intends to make Timmerman Junction into four-way stop within the next few months. Now, only eastbound and westbound traffic is required to stop. According to ITD, there were 26 traffic accidents at the junction from 2000 through 2009. There have been three serious accidents at the intersection since June, resulting in injuries to 11 people.